Dining in Le Normandie, the premiere restaurant at Bangkok's Mandarin Oriental, is an excursion that every Filipino Foodie must experience. The restaurant regularly showcases Chefs who have been given the most coveted 3-Star Michelin rating. The Dining experience in Le Normandie definitely exudes luxury and exclusivity. This is not surprising considering that we have been told that one of its regular patrons is the queen of Thailand. To get to the restaurant, one must ride a private elevator away from the regular entrance of the other Hotel guests and patrons. The view of the Chao Phraya river is enchanting especially in the evening when one witnesses the charmingly lit ferries which serves as shuttles for the hotel guests. Fine Dining is not just about how good the food tastes. It should also provide a wonderful experience for all the senses. The food must be pretty, the waiters attentive, and one must be able to carry a decent and relaxed conversation with your company as one dines. Le Normandie definitely exceeded all of my expectations. Some notes for people who would like to dine like the queen: Reservation is a must. Gentlemen must wear dinner jackets. You should also be prepared to spend around 200 USD per person for dinner. Believe me though when I say that it's money well spent. Regina spent the fourth of July weekend in Cambodia. I was not able to join her so I am trying to capture the highlights of her trip by interviewing her. House of Queens: What interesting tidbit can you share about Siem Reap? Regina: The people from Siem Reap eat fish almost everyday but it's odd that their life expectancy is only 50 years. In terms of food --- they have Lemon Grass everywhere. It smells like tanglad everywhere you go. HOQ: How did you get to Siem Reap? R: I used my PAL mileage to fly to Bangkok because they had a mileage sale. It cost me 5,000 miles for that leg of the trip. Then I used Bangkok Airways to fly from Bangkok to Siam Reep. That's the cheapest way to get there. It cost me 10,000 Baht. HOQ: Where did you stay? R: We stayed at Tara Hotel Angkor. It's a four star boutique hotel with the price of a two star hotel. It's pretty but it's odd that the bag that they use for the toiletries had to be returned upon check out. I was going to use it for my film rolls but they asked for it upon checkout. Take note we're talking about a paper bag. But apart from that oddity, it was a very pleasant stay and the breakfast is good for the price that we paid. Added to that - it's one of the hotels closest to the temples. HOQ: For how long did you stay in SIem Reap? Do you think it's enough or too short? R: We stayed there for three nights. It's enough. For the common person --- by the end of the trip - you'd feel temple'd out. I know that some people say that one day is enough. I don't agree with that --- if you're just talking about Angkor Wat --- that's true. However --- there are other temples worth seeing and those temples even look better in our photos. HOQ: If there's one thing that you wish you could have done while you were there -- what would it be? R: Stay at Aman Sara. It's the Aman resort in Siem Reap. The tour guide said that when Angelina Jolie shot the Lara Croft movie --- she stayed in Aman Sara. This is contrary to popular belief that she stayed at the Raffles Hotel. BTW --- I was hoping to take a picture of the Aman resort --- but the only thing you can see are walls and tall trees. It's very discreet. Even their signage is written in Khmer so you won't know it's Aman Sara unless a local tells you. HOQ: How did you feel after the trip? R: Exhausted beyond imagination. We enjoyed the sights --- but as warned by everyone --- it's hot, humid, dusty. HOQ: Is the trip worth it? 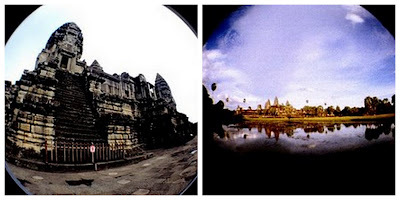 R: Plan a trip to Siem Reap in your lifetime. Make sure you still have the strength to walk - because there'll be a lot of walking. But it's worth it. Friends new and old, welcome to the house warming for the House of Queens. This is a refurbished version of a blog that I started last year. It has a new look and along with it are brand new posts which will hopefully encourage you and new readers to visit my home in the World Wide Web. This post brings together the first four articles that I have been working on this past week. Click on the link to find out more. Don’t forget to leave a comment before you leave. Me. Me. Me. All about Me. Discover a great new dish. In this post, I share a very simple YouTube video that we shot in the house. It shows Midori being trained to twirl by my best friend and myself. If you were born in the 70s like me, you would have memories of your family and relatives getting together in your living room to view your most recent home movies. The movies were crude and at times causes nausea as all movements of the camera are captured and not edited out. Today – making home movies has been made extremely simple with the tools of the new millennium. A lot of phones can take videos. Point and shoot cameras can also take videos. The best part of it all is that they are stored as digital files which can be easily edited via software like Windows Live Movie Maker. Of course – the most important technology of all is YouTube. This site has definitely provided the venue for regular people like us to show other people our Home Movies. I hope you enjoy the video. if you need some tips on how we completed this video, feel free to post a comment and we’d reach out to you and give you our tips. We’re not experts but we have done it before – so we’ll share as much as we can with you. Traveling around Asia, I came to discover that the pickled onion that I eat with Indian dishes is called Acar (pronounced Achar ). This of course reminded me of the Filipino side dish Atsara. 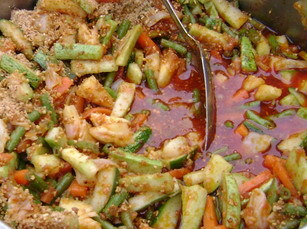 For the Filipinos, Atsara is best served with grilled and fried dishes and is almost always made with pickled Papaya. When I discovered Acar, that’s when I realized that Acar in Indian, and later on I found out even in Malay, refers to pickled vegetables or fruits. Just for kicks – you may also want to try our own version in the House of Queens. Mix in some peanut sauce or peanut butter into the recipe. The pickle and peanut taste blend well. Like any Malay dish – make sure you adjust how much chili you put in the dish. I personally like my dishes spicy. I am Lord Charlemagne. These are the names my parents gave me when I was born. As far as I know, my family cannot trace its lineage to any Royal Family; however the names conveyed my parents’ visions of greatness for their newborn son. Growing up, my parents’ dreams of grandeur became my own. As a little boy I had ambitions of exploring the world, discovering the cure for Cancer, or being the first man to land on Mars. Alas --- like any child I grew up and one by one the fantastic ambitions were replaced by reality. However, I have not stopped dreaming and I have tried my best to live a full life. I have also realized that a great life can only be achieved by sharing it with people. In The House of Queens, I hope to share my life with people around the world. I may not be able to physically travel to every proverbial corner of the earth but I am hopeful, that in this small space in the World Wide Web I can write about myself, my thoughts, and my experiences. In that process, I may be able to meet people like you who may want to take a peek into this life. Welcome to the House of Queens. This is my home in the World Wide Web. I hope that like my home in the Real World, it can be a place where friends, strangers, relatives and loved ones can visit and catch up with each others' lives. New Friends are always welcome. If you happen to like an article or are interested in the same things that I write about, please visit the Guest Book and leave a comment. I hope you enjoy your visit and I hope to see you again.